Cuddling over a book, we read to our children, sharing sounds and showing how speech matches letters on a page. In this way, we build literacy: Children become the readers and speakers of our native languages. But what of our native musical languages? Like speech, they surround us, and we, our children’s loving companions, are their natural first teachers. “You can send a kid to preschool to learn to read, but what if you didn’t read at home? Imagine your kid trying to develop language skills if you didn’t speak,” says Steven Demorest of the University of Washington’s Laboratory for Music Cognition, Culture and Learning. 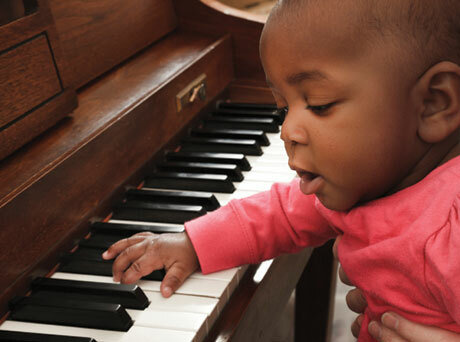 How can parents help build musical brainpower in their children? First, resolve to “speak music” at home. Even if you think you can’t sing, sing. “Singing is the most beautiful thing. The instrument that we are trying to imitate on any other instrument is the voice,” says Seattle Symphony music director Ludovic Morlot. Check out local programs. “Kindermusik, Musikgarten and Music Together are all wonderful tools for the youngest child,” says Campbell. As for technology, she says, “There’s plenty that can be acquired with music apps for developing the ear, allowing children to compose little things.” Campbell feels human interaction is also important. “There’s nothing like old-fashioned lullabies at bedtime,” she says. She also suggests exposing children to the Northwest’s many cultural festivals and music programs. Kids can play with real instruments at Benaroya Hall’s Soundbridge or at one of the Music Center of the Northwest’s instrument petting zoos. “Music is an extremely sophisticated language, but if it starts at birth, it’s an effortless, seamless process,” says Seattle Musikgarten teacher Nancy Kubo. With the popular Suzuki method, kids and parents learn music together — parents attend lessons and take notes. Seattle Symphony principal violist Susan Gulkis Assadi began playing as a 3-year-old Suzuki violinist. Now she accompanies her own 7- and 9-year-old daughters to their Suzuki violin lessons. ParentMap blogger Lea Geller acknowledged her own lack of musical literacy when she brought a piano, then a teacher (Rob Frain) into her home. On a recent afternoon in the Gellers’ living room, Frain bantered about football before settling into a lesson with 8-year-old Efrem. Later, he gently encouraged 4-year-old Fiona as she learned the difference between playing with her left hand and right hand. Frain suggests that before parents sign their child up for private lessons, they should consider that child’s readiness to follow instructions and pay attention. If your child is not ready for individual instruction, check out nearby resources and facilities: Are there instruments at your child’s school? Is there an elementary-school orchestra? How about a chorus? Does your place of worship have a children’s choir? “Groups of young children can make amazing sounds,” says Demorest. He encourages parents to find a choir and start children singing in harmony as young as 4 or 5. That’s how we build a shared language, and maybe best of all, a sense of the real meaning of harmony. Seattle-based writer and longtime classical music broadcaster Gigi Yellen has lately been hosting evening music on Northwest Public Radio. Music Center of the Northwest, 901 N. 96th St., Seattle. Infants through adults. 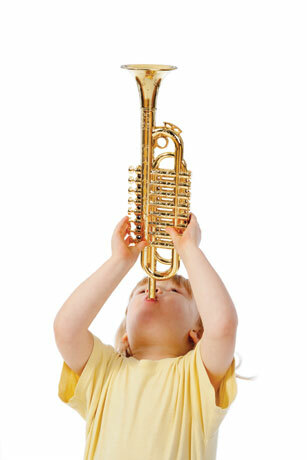 Programs include Music Together, Suzuki, individual lessons, ensembles and instrument petting zoos. Musicworks Northwest, 14360 SE Eastgate Way, Bellevue. Programs include Skype lessons, music therapy, Suzuki group guitar and jazz. Kindermusik. Classes are offered at Soundbridge, Second Avenue at Union Street, Seattle, and many other locations around the Puget Sound area. Music Together. Enter your ZIP code on the website to find a convenient location. Musikgarten Seattle in Magnolia (or find a closer one by entering your ZIP code at musikgarten.org). Progressive stages through age 9. University of Washington School of Music. Jenni Campbell, admissions and outreach coordinator, can suggest a teacher for your child. Does your house of worship have a children’s choir? Here are some other great places to start. Northwest Boychoir. Ages 6–13, by audition. Northwest Girlchoir. Grades 1–12. For grades 1–2, no audition is required. Seattle Girls’ Choir. Grades 1–12. For grades 1–2, simple song audition. Capitol Hill location. Seattle Children’s Chorus. Ages 3–6. No audition. Meets in Shoreline. Seattle writer Gigi Yellen's children grew up sharing her with radio audiences as she hosted, interviewed, and wrote about classical music for KUOW and Classical KING FM. She introduced ParentMap readers to Seattle Symphony Music Director Ludovic Morlot in our "Someone You Should Know" feature back in January. Young Artists in Action: Watch and Vote!